The Producers has wrapped… The Vivian Awards have been given… you may be thinking to yourself, “The folks at ALT must be so bored with nothing to do…” NOT! We’ve got lots happening in the next month! And one VERY cool and important thing requires YOUR help! 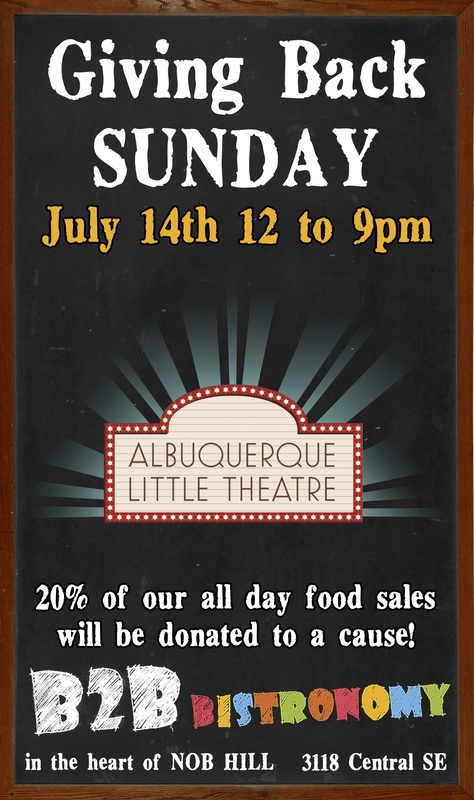 On Sunday, July 14th, we’re having a delicious fundraiser at B2B Bistronomy (Beers to Burgers) on Central Avenue! It’s located at 3118 Central Ave. in Nob Hill. On the 14th, just show up between Noon and 9p, enjoy a delicious meal (the food is great) and 20% of the proceeds will automatically be given to ALT! We’re a nonprofit, so this will be a huge help to us, and we need everyone to come out and support us. We love you, and we thank you in advance for your support! See you at B2B on July 14th! Come hungry! ← Congratulations to those who won “Vivians” last night!